This is the type of waterfall that WaterfallNow is known for specializing in. There are different materials ranging from natural stone, veneer panels, boulders, concrete, brick, fiberglass, gfrc and even styrofoam. WaterfallNow prefers fiberglass over the alternatives due to the lightweight and flexible nature of the rock. As it is molded off of real rocks, the rocks maintain the same textures that natural rocks would. The rocks can be painted to any color and even painted again to change the color for a different season. Rock waterfalls with natural stone are usually seen in everyday landscaping gardens whereas artificial rock waterfalls are seen around tropical pool resort-like environments. Note: When retrofitting a waterfall onto an existing pool, it is important to note that the weight of concrete or other materials can cause damage such as cracking if not careful. Fiberglass rocks are a safer and more cost-effective alternative. This kind of feature is where water slowly trickles or cascades down from the top of the wall. The water is fed back up from a pump and tube to the top and this process continues. Note that most water walls require a filter to be installed to avoid clogging from mineral build up. These are an elegant water feature idea that can go both indoors and outdoors. There are different sounds of cascading water depending on the type of material used for the front panel. These are increasing in popularity especially in corporate settings. Many companies are opting to have an acrylic or glass water wall with their logo engraved. The addition of LED lighting makes for a truly spectacular piece of decor. Rain curtains are a great design piece to add moving water to a room. These can be built both indoors or outdoors. Indoor units are typically made with thin clear strands that run from the top of the unit to the water channels where the water is then fed back up through a pump to fall back down again in a continuous motion. There are many excellent photos of rain curtains that can be found online. These pieces can be customized in virtually any design. Speak to your local water features experts to learn about some of the possibilities. Scuppers are water features where water flows down a small ledge before descending into a pool, pond, or water container. There are many variations and names as well as materials (aluminum, acrylic, plastic, fiberglass). These produce more sound than a rain curtain or water wall and are a spectacular at night with the addition of LED strip lights built into the spillways. Waterfall spillways and sheet falls are similar in that they are thin flattened flows of water coming down in a long line the width of the spillway unit. These are similar to a water jet however there are different types of flows. These units are typically wall-mounted to the side of a pool wall or retaining wall and has water shooting out in a thin line or flowing down. One common version of a sconce water feature is a lions head with water flowing from the mouth. These are a water feature with increasing DIY (do it yourself) popularity. Many high end laminar jets that are programmable can go for more than $2000 USD per unit. WaterfallNow carries some custom made stationary units for customers that simply want a unit that flows in a straight line into a pool without any special controlling requirements. These laminar flows create the impression of a solid LED lighted tube. At night you will see the LED lighting flowing through the tube cast light into the area where the water meets the pool. A definite must-have for nighttime pool enthusiasts. These are often sold in landscape supply stores or custom-made by water features specialists. They are water features with a pump that channels water through and out the top of hollow cored out faux or real rocks. The more common material used is basalt rock. These can weigh thousands of pounds or can be made light enough for a single person to carry depending on the materials used. There are an infinite number of fountain variations. WaterfallNow can make customized programmable fountain units with aluminum and other materials for Vegas Bellagio style light shows. These water features shoot water up out of the pond, pool, or basin and fall back onto themselves or at an angle. They come in an infinite variety of designs and styles. Have fun designing your next water feature project! There is an art to constructing custom rock garden waterfalls. The time, effort, investments, and even failures that went into learning how to get started is often overlooked by those who are unfamiliar with the industry. The ability to work around issues and solve problems is a very useful and essential skill. We’ve encountered hundreds of issues over the years along the way but were always able to find a way to make things work. In the end, that learned experience is a part of the value we bring to you. We’ve tried styrofoam, concrete, our own panel system, and many other techniques. What we found was that most projects were at the time either too large or too costly for smaller clients. We have since developed a way to serve a wider range of clients. There is a lot of trial and error that goes into learning how to build custom rock features. This is especially true for those who did not go to school to learn these things. People sometimes wonder why counselors or lawyers can charge so much for the advice that they give. What most people miss is the amount of time (many years in school and of experience) and money (books, hiring staff, education) that went into being in a position to do so. It wasn’t easy to get to that point as most people think. Are you looking to learn how to do what we do which is creating 100% customrock garden waterfalls and rock water features for your garden or place of business? If so, send us an email along with your experience. We have many years of landscaping experience in a family business and experience with MANY other ventures along the way. When we tell people that failure is just an opportunity to learn it is coming from a place where we know people must fail first in order to succeed. Spouting of goals and plans for making something come about is one thing – an entirely different thing to actually do it. What do you hope to accomplish? Is it your first time creating your own rock water feature? You may email us if you would like some of our guidance. Just type [crw] in the subject line. We will provide you with guidance with the hope that it saves you time, money, and stress. When we meet someone with a passion to start their own business, determine their own level of income, and serve others we can introduce them to new opportunities for personal growth in partnership with us. The attitudes that we carry towards life helps us guide our actions which in turn affects our results. Our craft requires some natural talent. We operate in a specialized or niche market serving a broad range of clients. This is part of the reason why you won’t find many people doing what we do. If you are planning a rock water feature for your next renovation project and would be interested in pursuing a business relationship in one form or another simply send us an email or speak with Moses 778-788-8603. We believe in the power of word of mouth marketing and obtaining new business through referrals because that is where the majority of our business has come from over the past decade. We always make room for new growth opportunities and welcome anyone looking to grow with us. Our business clients are more than just customers. They are long-term friends that we stay in contact with over the years. When you do business with us you automatically become a part of our network. We are in the process of implementing new marketing strategies to make 2014 a breakthrough year. WaterfallNow started out under 3-4 different names during a transitioning phase out of the traditional landscaping arena. We went from landscaping on large commercial and residential landscaping projects (something we were happy doing at the time) but have since found a new home in a market with little competition. With the right team in place we can only continue to grow. Can you make a list of 100 other places that do what you do in your market? Chances are that you can. But how many people know someone that can do what we do? Very few. This is why our specialization in creating 100% custom hand-made rock features both indoors and outdoors is our field of choice. We have made many rock patio waterfalls, rock retaining walls, garden waterfalls, and water features for fish ponds or pools. There is virtually no limit to what we can do. 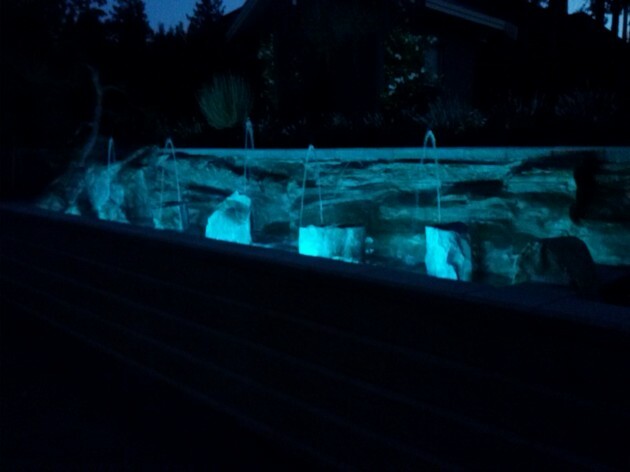 We have made many custom rock garden waterfalls throughout the Lower Mainland with a wide range of satisfied clients. If customization, low-maintenance, and long-lasting waterfalls are on your renovation list then give us a call. We help our friends by featuring their waterfalls and business in our videos, websites, and providing solid referrals for people we know that are seeking their services. We serve the entire Lower Mainland (Vancouver, Surrey, Burnaby and all locations). Do you want to be known as the best at what you do? Do you want to attract more customers to your place of business? Let’s work together to not only renovate your place of business but also the image and brand. People don’t talk about renovations that are unremarkable. They do however like to talk about our water features with their friends and family. Many people are already looking for what we do [Custom Rock Garden Waterfalls]. Soon more people will be looking for something fresh and unique and look for something other than the cold nature of modern designs. By then WaterfallNow will be in the perfect position as the leader in BC for 100% custom rock water features and our services will be known for its increasingly high demand. Those who are decision makers, are good at determining investment decisions, and understand market value, will be able to take advantage of the services that we are currently providing at the low introductory rates that we offer. We are focused on intentionally growing our company as well as those businesses that are in mutual partnership with us. Whether you enjoy the soothing sounds of trickling water or an energizing torrent of rushing water we can work with you to design something spectacular that can’t be bought anywhere else. Our custom rock water features are uniquely designed with you in mind. 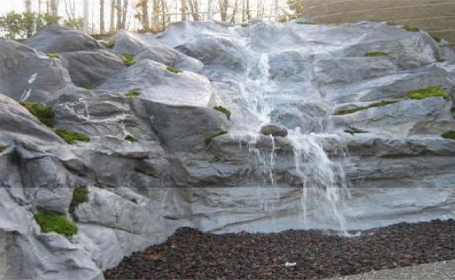 We have been practicing the creation of custom-made artificial rock waterfalls for many years with many satisfied clients throughout the Lower Mainland. Moving forward we look to create more memorable experiences for all of our clients in 2014 and in the years to come. Our clientele is very diverse ranging from commercial to residential, indoors and outdoors. Whether you are the owner of a resort that would like something custom-made for your waiting areas or just someone looking to renovate their home we can provide you with what you need. Perhaps you are looking for more than a simple water wall and would prefer a unique artificial rock water wall spanning an entire wall. That is what we do at WaterfallNow. No two projects look the same. We begin with hand-made rock panels that are patched together to form the final shape. Our custom rock water features are unlike concrete or other faux rock applications. These are not stamped nor carved. They are hand-made rock panels made using a blend of natural and synthetic materials. The natural dips, contours, grooves, and texture resembles that of natural rock and thus gives a more realistic impression. We don’t use the word custom lightly. 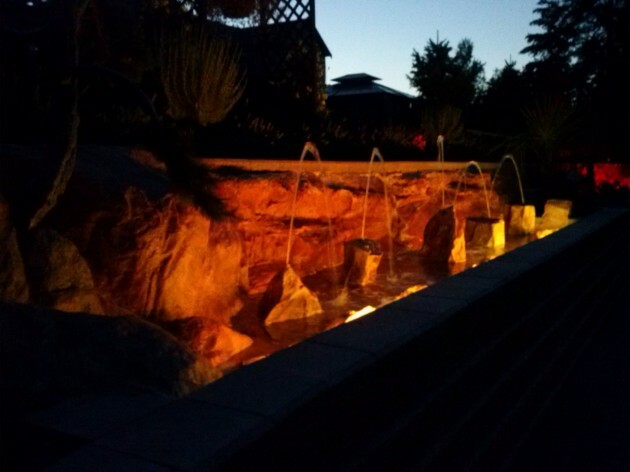 We literally create custom rock water features in any size, shape, or color and even customize the plants and lighting that goes along with it. Look no further than WaterfallNow when seeking out the absolute best in creating unique custom rock water features. Contact us today. Want a unique completely custom hand-made and uniquely designed water feature specific to your desires? WaterfallNow puts a lot of careful planning and thought into each rock water feature that we create. WaterfallNow’s artificial rock waterfalls, rock fountains, retaining walls, or decorative rocks can be used for both indoor and outdoor applications. They are lightweight and versatile enough to solve any commercial or residential renovation projects. While there has been an increasing in popularity of miniature fountains that can be purchased online from Amazon or Ebay we don’t think it will be long until some people become bored of seeing the same generic water walls over and over again. Water walls are a very beautiful concept but limited in scope. Some people want something that is perhaps bigger, more colourful, unique, and that has a more life-like characteristic to it than cold-steel. WaterfallNow produces custom indoor outdoor water features that are unique, 100% custom hand-made on site. We spent a lot of time investigating ways to cater to the people described above and came up with the methods that we employ today. People want something that resonates with their style, is unique, and not something that someone else can simply buy from a store. The good news is that there is something that is far more interesting, more relaxing, and better sounding and that is what we offer to our clients with each water feature that we create. 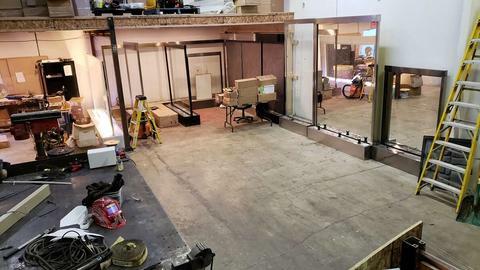 When compared to a small figurine type fountain or wall-mounted waterfall it is easy to see why our particular skillset is in such high demand. If you are not a fan of white noise produced by the sound of water crashing down we can create a water feature designed for water to cascade down. Many of our clients enjoy the similar sound of a natural waterfall in their backyard. They sometimes become mini habitats that attract different animals and birds. With the proper landscaping and lighting these waterfalls become an exotic location for you and your family. WaterfallNow caters to clients who want something that nobody else has, wants it first, and wants it big. What separates us from others in the water feature industry is the ability to cater to a very niche market as well as to the broader market of koi pond enthusiasts, home renovation experts, or just people that want to enjoy time spent in their own backyard. The experience that we’ve accumulated thus far can only improve our ability to serve you better. Our philosophy is to be proud of everything we do. We want to be proud of the smallest projects as much as the biggest projects. What matters most is that the owner of a custom-made waterfall that we create has a smile on their face and can enjoy all of the benefits that our services provide. WaterfallNow’s team has many decades of landscaping experience. Although it is no longer our area of focus we do provide FREE garden consultations for all of our clients as well as low-cost basic landscaping just to go the extra mile. In a nutshell, what we require is your permission, a concept or idea, and we go to work to create something beautiful that you can enjoy for many years to come. We sometimes receive phone calls from people thanking us for the work that we’ve done in their neighbors yard. You are perhaps wondering what are the benefits of fiberglass rocks? Most people don’t know the ups and downs of fiberglass vs concrete so we’ve added some insights below. Fiberglass truly is a remarkable and revolutionary product. Watch this man wack the boat at 1:15!! I know what you are thinking. He hit the boat like a little girl! The reason I shared this video was not to show that fiberglass is indestructible but to demonstrate that should someone have a little too much to drink and decides to kick, drive a car into, have a tree branch falls onto, or wail on with a pipe a fiberglass reinforced rock will still remain structurally intact. You would have to put some real effort into causing some damage. Minor holes or cracks caused by intentional blunt force can be remedied with a simple patch job. If you can punch a hole in one of our rock panels with your bare fist we will buy you a beer and pay for your medical fees. Long lasting, waterproof, corrosion resistant and non-conductive. It is an amazing product that can be molded into practically anything, giving design engineers unlimited possibilities in the ability to make long and sweeping contours, allowing for much more design freedom than metal or wood based structures can. Because of these characteristics, fiberglass should be considered whenever there is a significant amount of fabrication to aluminum or stainless steel as often times a better part can be made at a lower or very competitive price with each molded part being consistently well within manufacturing tolerances. We have a keen awareness that price does affect a prospective client’s desires. WaterfallNow has received many thanks from former clients who otherwise would not have been able to enjoy such luxuries. Fiberglass is stronger than sheet metal (pound for pound) and it will not rust – perfect for outside use or in locations near water, especially salt water. Fiberglass is also resistive to corrosive chemicals, and, when made with special fire-retardant resins, in the event of fire, your products only char and do not burn up. Why is this relevant? Some people desire steel water features so it is worth noting this fact. Resin is a lightweight, durable, synthetic material made from recycled plastic. It requires little maintenance and it holds up well to outdoor use. Rain and snow won’t cause it to rot, chip and flake like certain paints, or rust like certain metals. It’s an excellent product to use for a water feature. These fountains will blend wonderfully in your water garden or as an indoor tabletop fountain. Some reasons to consider Fiberglass over Concrete: Unfortunately concrete applications which look beautiful also come with some disadvantages for the unwary client. They may require a lot of maintenance to function efficiently and safely. Thinking of getting an over-hang for a spillover? You could be putting lives at risk with an overweight portion of concrete that does not have the proper reinforcement to support it. If you are considering the differences between a fiberglass and concrete swimming pool (something we don’t do but is worth noting) first consider the fact that concrete requires monthly professional cleaning to ensure that no algae can form along the walls. If you are the owner of a concrete pool you are already aware that after a decade you have spent anywhere from $14,000 to $18,000 purely on maintaining your pool properly. Failing to do so allows the germs, bacteria, and algae to breed in the porous concrete basin which makes for an unpleasant experience. Failing to keep up with regular maintenance can be a difficult issue to fund. The porous nature of concrete often requires having a gel coat layer to prevent the water from completely draining out. Difference in weight may be a reason for considering a fiberglass rock feature over a concrete but it could also go the other way. Concrete applications are generally a permanent fixture meant to remain at that location. If you ever need to upgrade to something fresh, perhaps a different design, you will be destroying all or part of your existing waterfall. With a more flexible approach (fiberglass), should you decide in the future to move the waterfall to another location we can do so and also add onto it. Our clients enjoy their waterfalls so much that some even requested us to move it to their new home and so we did. Something worthy of noting is that rock water features (whatever the method or substance of construction) tend to raise property value (landscaping). WaterfallNow’s rock features operate in all 4 seasons. One common issue with concrete was the damage caused when rainwater seeped into a crack in a concrete application and upon expanding caused further damage to the concrete. This is known as freeze-thaw action which leads to deteriorating applications. Will this be an issue with a concrete rock? Possibly, unless you hire a professional that has mastered a special technique. Sample photo of the effects of erosion on concrete. Fiberglass on the other hand does not erode from weather conditions nor does it crack. These are just a few more of the many benefits of fiberglass rocks. Fiberglass rocks are much less labor intensive. While concrete applications can look very beautiful for outdoor applications they are generally not an ideal solution for indoor renovations if time does not permit. Construction of concrete applications often requires many laborers who must work quickly and be careful ensure the final product is fully functioning before curing. It can be a nightmare for a contractor who cannot understand why or where there is a fault if a concrete application is not running. Hire professionals with a great track record. As for fiberglass rocks, the individual rock panels are pre-made in a different location and brought on site where they are cut, bent, shaped, folded and patched together in a matter of days. Cost Effectiveness due to lower costs for maintenance, labour, and warranty work. A lighter and stronger product also results in lower costs for shipping and storage. Fiberglass is durable but it depends on what you need. Do you prefer cost effectiveness over the ability to kick or drive a car into a concrete rock application and not have it break? Most people simply want something that is aesthetically pleasing to watch and listen to at a good price. They don’t want the hassle of maintenance if left unchecked that will leave a water feature inoperable due to high cost. WaterfallNow’s fake, faux, or artificial rocks however you prefer to call them are very easy to maintain. Often times the only thing that requires updating is the water pump itself depending on the usage (can last 6-10 years). Want to customize the flow of water? We simply adjust the plumbing and type of pump. Pond or Pondless is a choice and because we can relocate our custom artificial rock waterfalls they can be upgraded to attach onto an existing pond or moved to act as a pondless (hidden pond) waterfall. How does the water keep coming out and where is it going? Uh.. Magic.. No, actually it is just water cycled through a pump back to the spillover or to the top of the rock feature. We use EPDM rubber pond liner. The only way the water would leak is if someone intentionally cut a hole in the liner. If a hole is found it can be patched or a new liner can be placed over top. Pound for Pound Fiberglass is roughly 17 times stronger than concrete. Would you want a concrete feature this size put in your living space? I personally would. But what happens if you get tired of it and want to move it? Ref: jackhammer video. Our rock waterfalls are so light they can even be placed on the back of a pickup! On the other side we sometimeso work with concrete rock panels. Depending on the project at hand we can alternate between concrete paneling and fiberglass rocks. We like to use our fiberglass rocks to create unique designs but are flexible enough to do whatever the client desires. About what we do: WaterfallNow uses a blend of natural and synthetic materials to create a strong outer layer which can promote the growth of algae on outdoor applications giving them a more natural look over time. The benefits of fiberglass rocks are many. We hand-craft the inner membrane which ensures structural stability of the final project. The popular consensus from the feedback that we receive is that custom rock waterfalls are a GREAT landscaping idea and most people want one. The issue is that most people cannot afford one. WaterfallNow wants not just to renovate high end luxury homes, hotels, and casinos but to give the everyday person a way to enjoy resort-like settings in their own personal living space or yard. Whether you enjoy the soothing sounds of trickling water or an energizing torrent of rushing water we can work with you to design something spectacular. 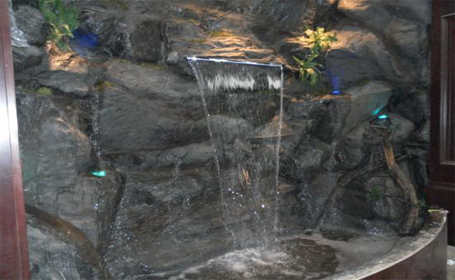 The indoor rock waterfalls created by WaterfallNow are unlike anything else in the market.These are not concrete that are stamped or carved nor are they made of styrofoam. Using a blend of natural and synthetic materials we create long-lasting, low-maintenance, unique and stunning creations that you can enjoy for many years. 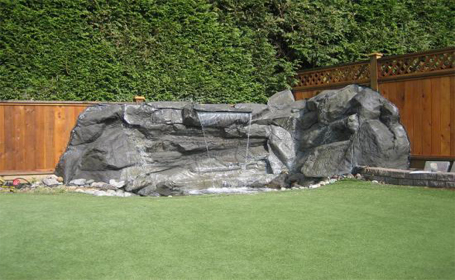 We have been practicing the creation of custom-made indoor rock waterfalls for many years with many satisfied clients throughout the Lower Mainland. Our skill and expertise in designing realistic indoor rock waterfalls along with competitive pricing means that you as a client are getting the best. Our clientele is very wide-ranging from commercial to residential, indoors and outdoors. Whether you are the owner of a resort that would like something custom-made for your waiting areas or someone looking to renovate their home we can provide you with what you need. No two projects are ever completely alike. We begin with hand-made rock panels that are patched together to form the final shape. Unlike pieces of Lego which are fixed, our rock panels are all cut, bent, and folded to fit the desired shape. The final result is something that is often hard to tell apart from the real thing and look especially nice blended with exotic plants and trees, special lighting, and fog generating equipment. Any shape, size, colour, place we can do it all. 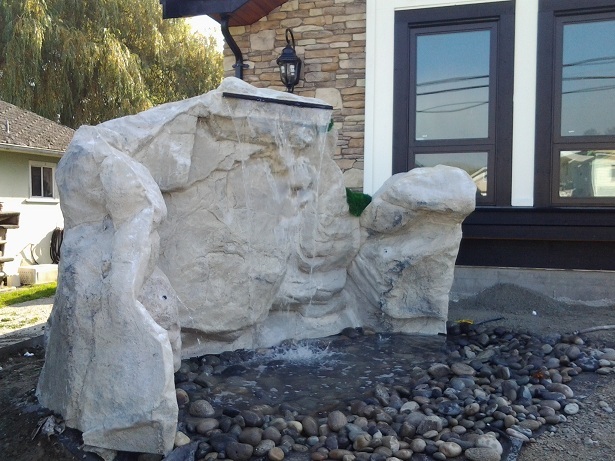 Would you like to know how you can get your own custom rock water feature? Give us a call. We are also always open to forming mutually beneficial business relationships.